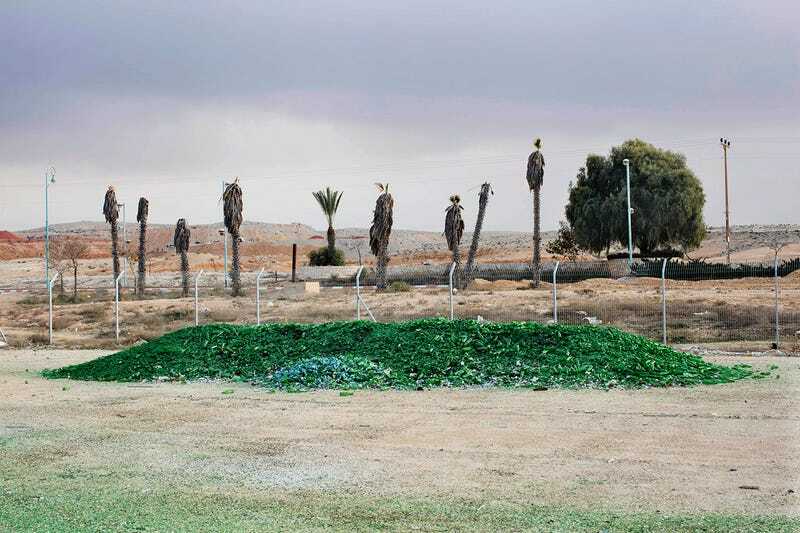 Deep in the heart of Israel’s desert, shimmering mountains of green, brown and white glass dominate the landscape, awaiting a new life. It’s a beautiful spectacle. 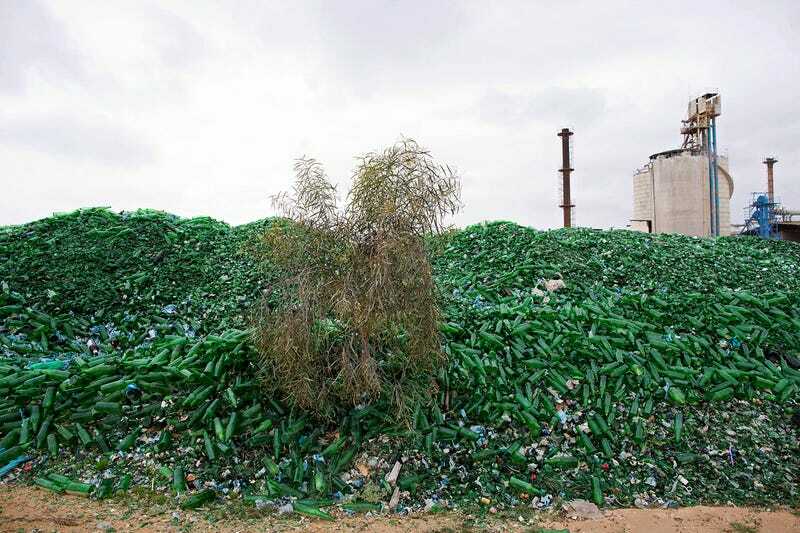 Here, at the Phoenicia Glass Works Ltd. in the town of Yeruham, a million bottles and containers are produced every day for beverage giants such as Coca Cola and Pepsi, as well as Israeli wineries and olive oil companies. 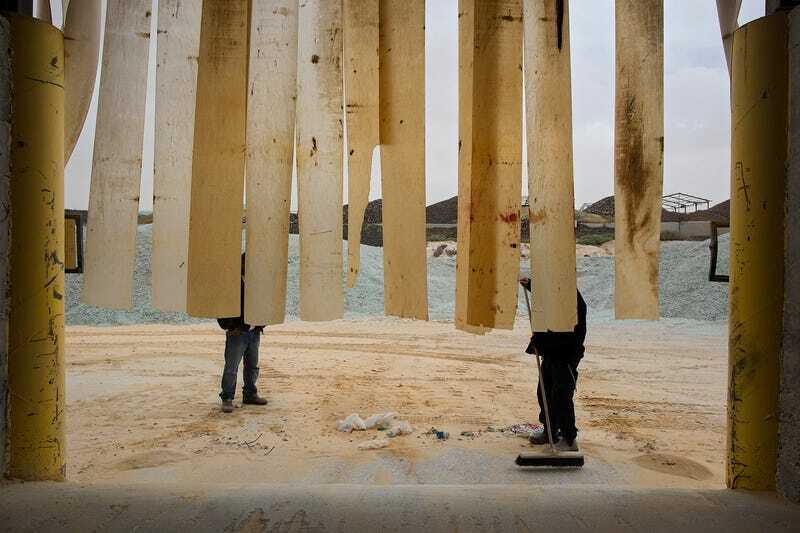 Thanks to Asscociated Press photographer Oded Balilty we can have a rare peek inside this dazzling place. 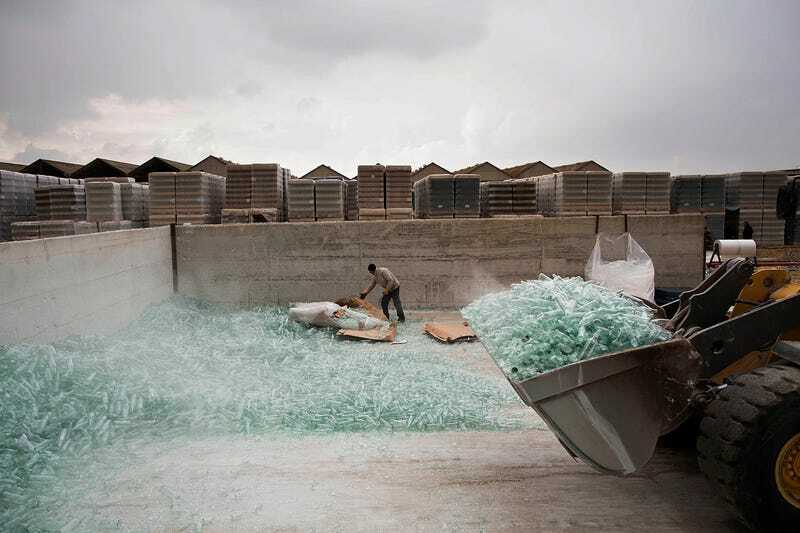 Israel’s only glass container factory works around the clock, every day of the year. 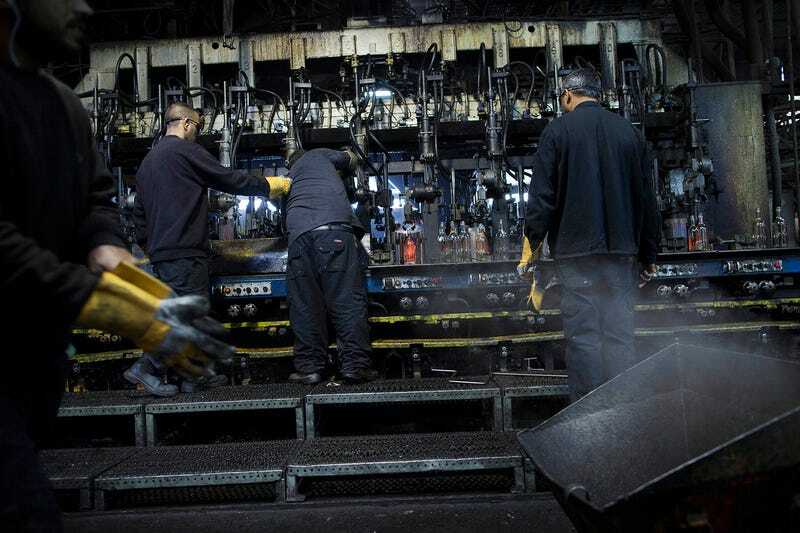 About 250 employees keep things running, and they even work on Yom Kippur, Judaism’s holiest day, when everything else in the country grinds to a halt. 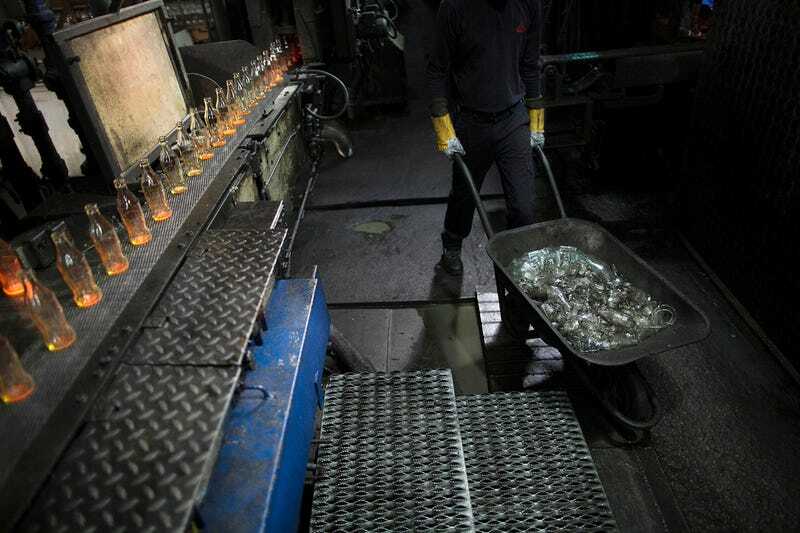 During the manufacturing process the glass pieces are shoveled into the ovens to be fired into new glass bottles. Sand, the basic ingredient of glass, is hauled in from a nearby desert quarry. The workers can never turn off the ovens, because the molten glass would harden and clog them. 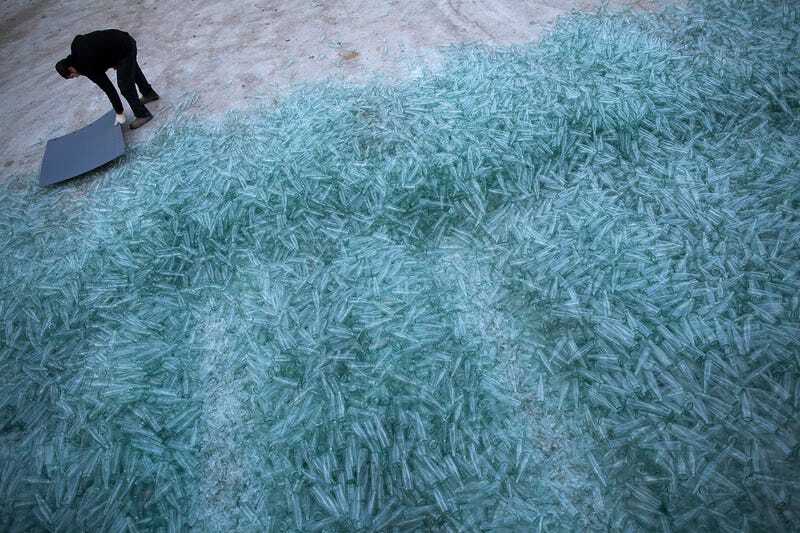 The factory also recycles glass bottles from across the country. 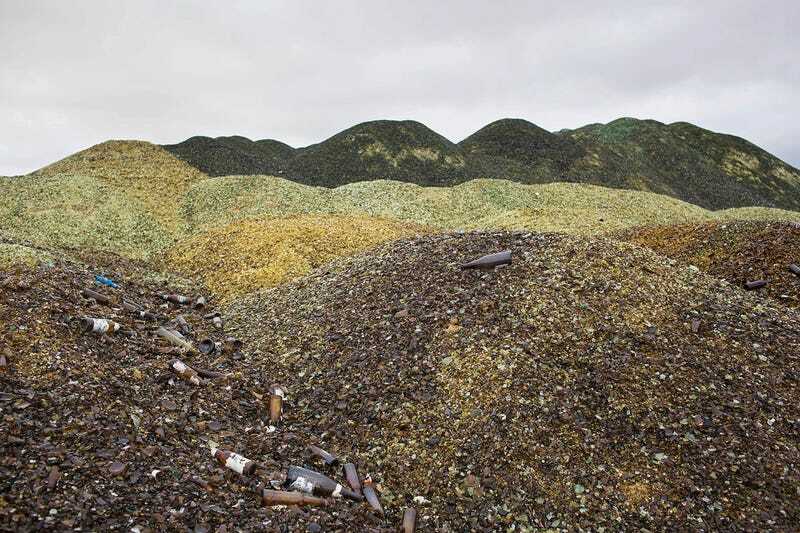 Giant machines grind the bottles into shards and piles them into rolling hills of green and brown in the factory junkyard to be melted into new bottles later. The colourful mountains of glass are also stunningly huge—50 feet high and span the length of several soccer fields. 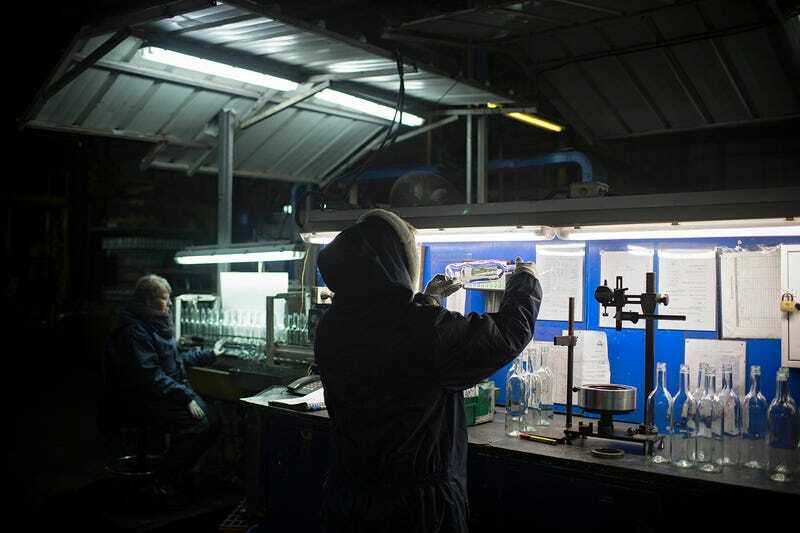 An employee checks the quality of glass bottles on the production line. 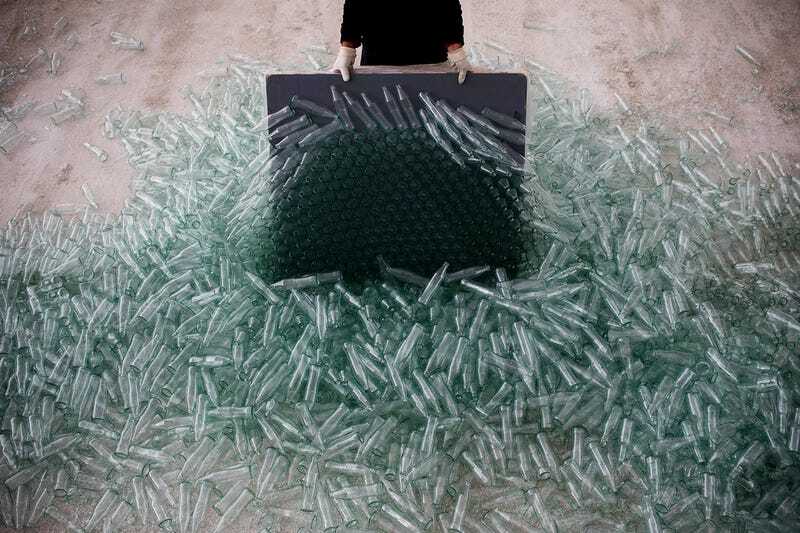 An employee carries a box of defective glass bottles to be recycled. 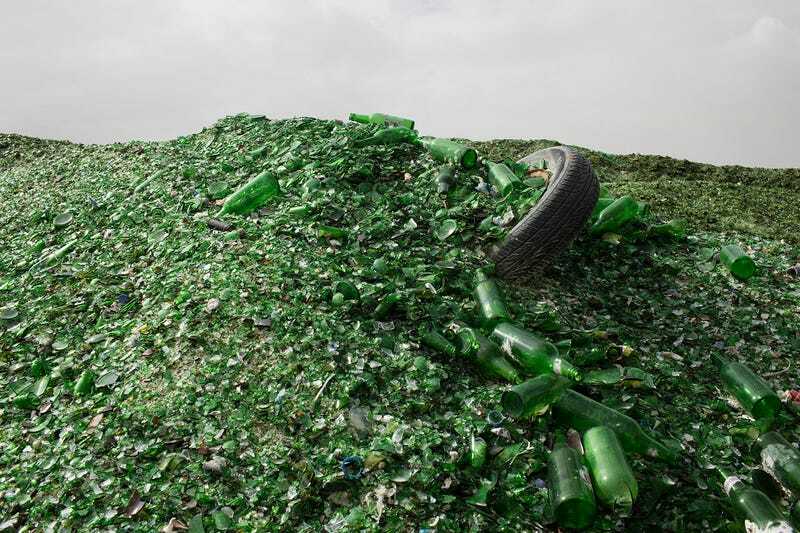 Glass bottles move on the production line. 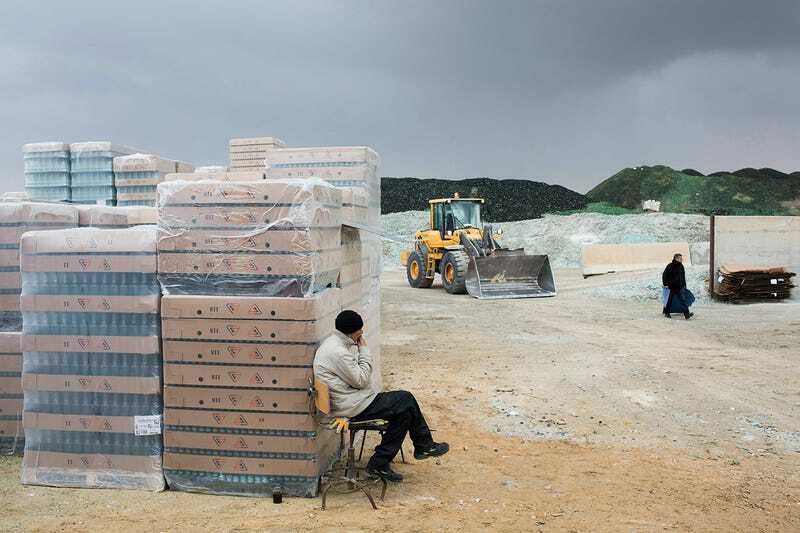 A worker takes a cigarette break. 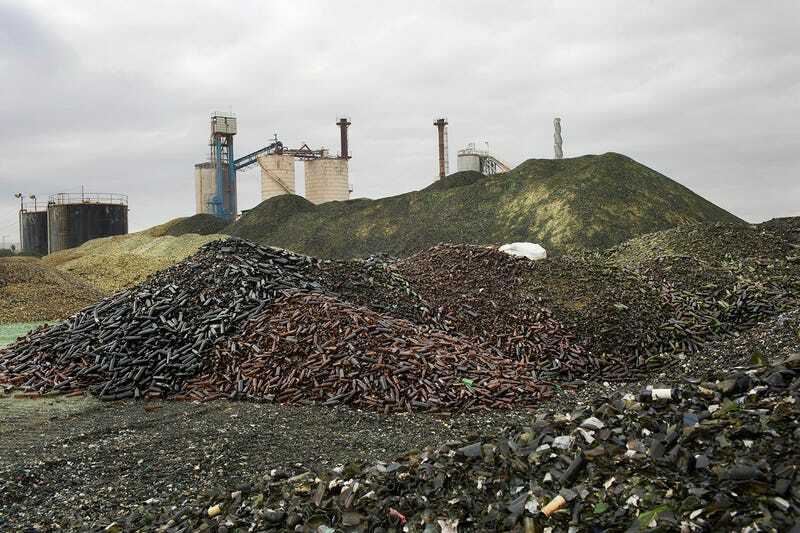 Broken glass bottles are piled up to be recycled. A worker pushes a wheelbarrow with broken glass bottles while new Coke bottles move along the conveyor belt. 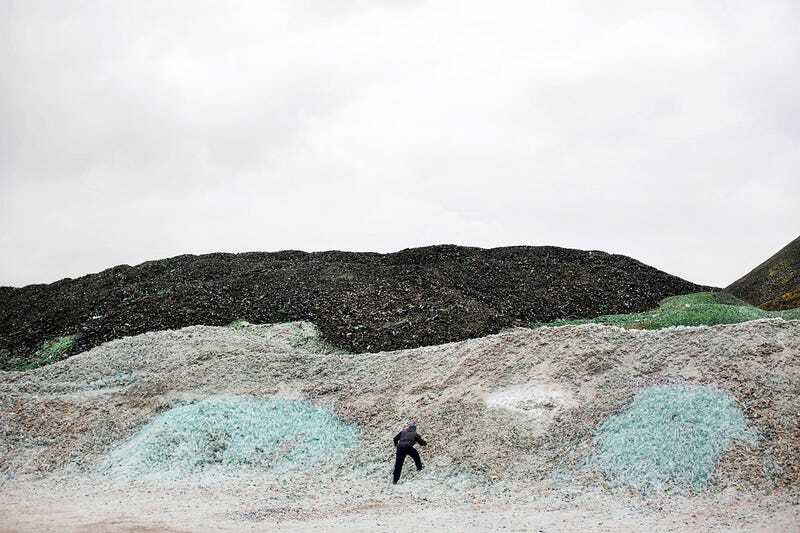 A worker sweeps sand used to manufacture glass bottles. 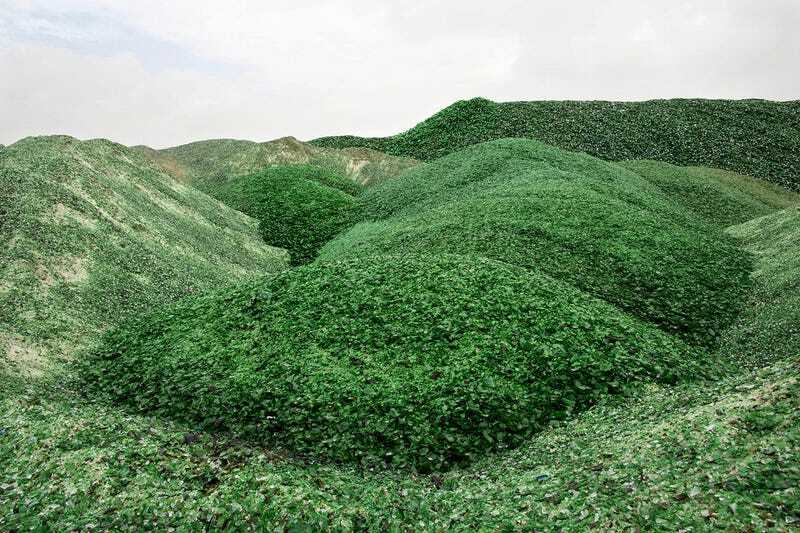 A tire hides in a hill made of green glass bottles. 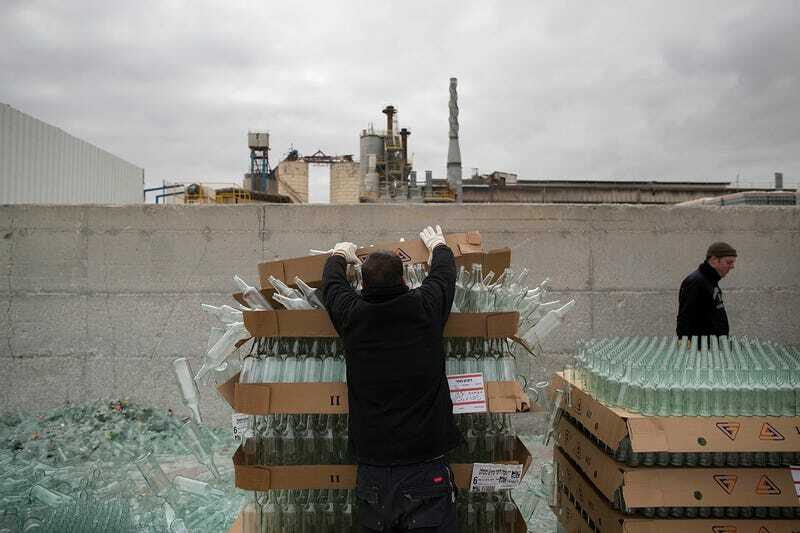 A worker breaks defective glass bottles. 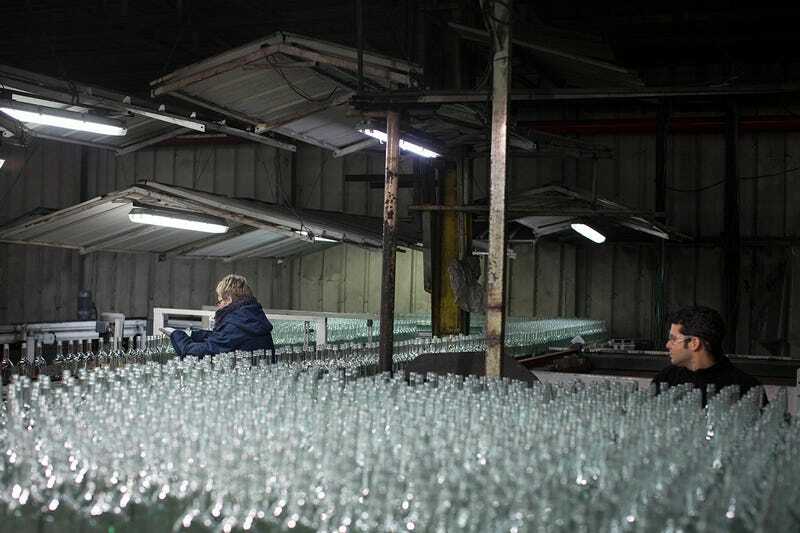 A worker breaks more clear glass bottles. 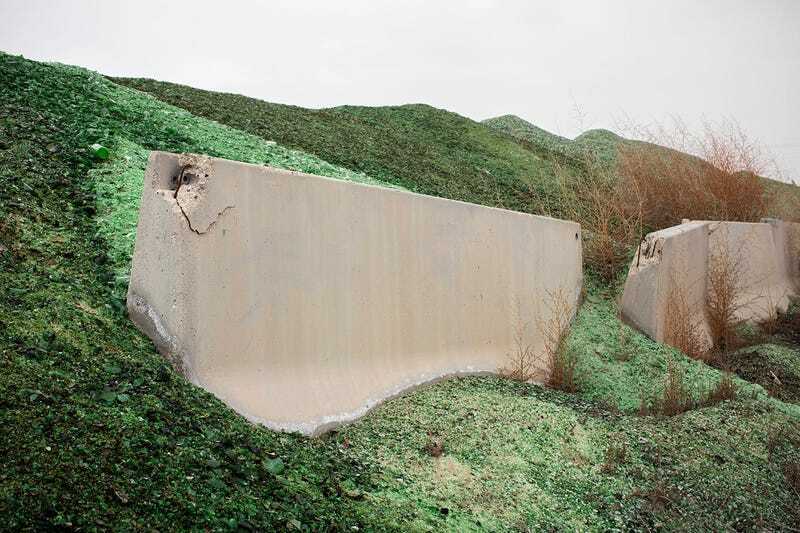 These rolling green hills are made of glass. Birds fly above broken glass. The landscape is undeniably industrial but somehow beautiful. 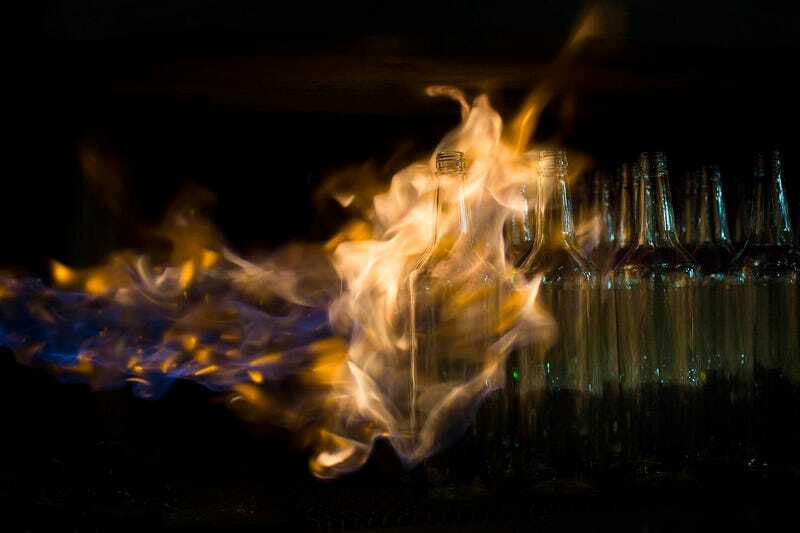 Bottles become reborn in fire. The brown and green glass mountains look uncanny. 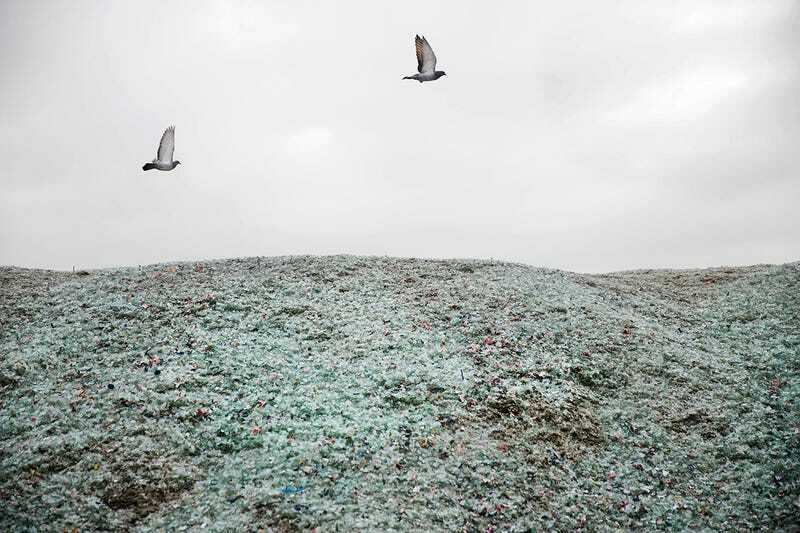 A worker collects plastic bottles. This is bottle crushing at its best.